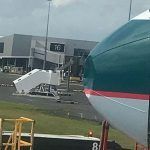 Cathay Pacific flight #CX198 from Auckland to Hong Kong safely returned to Auckland after the radome was hit by birds impact during climb-out. The Boeing 777-300 (reg. B-KQR) nose was stoved in on impact with what was reported as “multiple birds”.